True equity. Administered and governed on the blockchain. In our last post – The State of the Base Q1 – we spoke about how difficult storing and managing your cryptocurrencies and tokens can be and how we will be making it easier for even your granny to use our Octo Vault™. Now we would like to give you a deeper understanding of our Octobase Equity Partnership, how you can make an offer to acquire Octobase shares, what the purpose of our token is and, what exactly Octobase shares will entitle you to. Octobase will be taking a unique approach to our angel funding round. We will be giving investors the opportunity to make offers to purchase a portion of the shares in the company. Potential investors will go through a vetting process that will consist of a few questions about who you are and include a verification of your government issued ID documents. Since we are offering true equity, only verified participants from territories that are not excluded will be entitled to take part in our equity funding round. After going through our registration process, you will be able to access our equity offering user interface on Octo IO, where you will be able to view other offers that other investors have made and to make your own by selecting the amount of shares that you want to acquire and the price you want to pay for those shares. When your offer is made your funds are safely locked into an escrow smart contract. As offers are made, our Board of Directors will consider all offers and either accept the offer or determine that it is not strategically viable for Octobase’s goals. Should your offer be accepted, you will automatically receive your OEP tokens which represent a direct shareholding in the company. If your offer is not successful, your funds will be automatically returned to you. Our angel funding round which starts at 12:00 on the 15th of March 2018 UTC, of 10% of Octobase’s shares will be made available in the form of Octobase Equity Partnership Tokens (OEP). All offers and share issuance will be administered on the Ethereum blockchain. Octobase Equity Partnership Tokens are ERC 20-standard tokens which are digital Octobase shares on the Ethereum chain. OEP tokens will be administered as equity tokens and the purpose of the token is to give the address holder the rights to dividends and shareholder voting on important company decisions. Company governance, voting, and dividend payments will all be administered on the blockchain to give shareholders complete certainty and transparency over their investment. The holder of OEP tokens will have dividends automatically distributed to the address that the OEP tokens are held in as laid out in the terms in our smart contract. For the holder to vote on important company decisions, they will be able to use our user interface to interact directly with the smart contracts governing our on-chain voting by signing their vote with their private key that is linked to the address that holds their OEP tokens, and the result of that vote will then be recorded on the chain. Our token is not a utility token dressed in a suit and tie. We are giving qualifying investors a chance to acquire real equity in Octobase and to share in our growth, while helping us to develop our vision of making blockchain and cryptocurrencies technologies easier to use, easier to understand and most importantly, safer to transact with. The blockchain world is still an unforgiving one that is difficult to use and even more difficult to fully understand. We aim to change that by providing everyone with the tools they need to fully utilize the world’s blockchains. Co-founder & Head of Operations at Octobase. 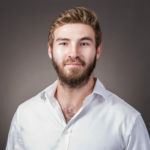 In addition to advising all of his friends that trying to mine bitcoin with a laptop is not Eldorado, Hank comes from an entrepreneurial background with experience in deal structuring, buy-side finance, real estate and international trade. After having been persuaded by his father not to put his life savings into bitcoin in 2011, he’s been trying to recover from the trauma by building a blockchain company ever since. Thanks for sharing! Feel free to like our profile to stay up to date.